It is a sad time for Ash Trees in Pennsylvania. They’ve been battling Emerald Ash Borer for over a decade, and unfortunately, the insects are gaining the upper hand. Ash Trees are a staple in North America, known for their beauty, strength, and versatility. Now they are being decimated by tiny green insects moving at an alarming rate. According to Penn State’s Department of Entomology, Emerald Ash Borer have killed over 40 million trees in the united states. In order to decide how to take care of any Ash Trees on your property, you need to understand how these insects kill trees and what signs to look for. Back in 2002, these shiny green beetles first showed up in North America and, according to the Arbor Day Foundation, are believed to have come over on shipping materials from China. From the Detroit area, they have been eating their way throughout the country and have left a wake of decimated Ash trees in their path. These beautiful yet pervasive insects are a 100% Fatal Pest! Once an Ash tree is infested with Emerald Ash Borers, it will die within 1-3 years. Our own Rob Nagy spoke with PBS 39 about the Battle to Preserve Ash Trees in this video report. Is Your Ash Tree at Risk? Yes! The question at this point isn’t If your Ash tree will become infested with the Emerald Ash Borers, it’s When will it become infested? These insects have covered a shocking amount of ground in the last few years. If you have an Ash Tree on your property, it is vital that you have it inspected by an ISA Certified Arborist now. If your Ash Tree is still healthy, your Giroud Arborist will recommend Tree-age trunk injections. Tree-age is the only treatment that fully protects Ash Trees from Emerald Ash Borers. The experts at Giroud Tree and Lawn know that Tree-age provides the best control against Emerald Ash Borer and it last for two years. Moisture Loss: Emerald Ash Borers cut off the flow of water and nutrients through the tree. Additionally, the fatal pest creates thousands of exit wounds. Both conspire to dry out the tree and make it brittle. Weak Structure: the same straight, tight grain that makes Ash trees great for baseball bats and splitting firewood is also why it’s limbs and leaders easily split apart. The result is a dry, brittle tree that is at high risk for breaking apart. Removal must be done ASAP, and a dead Ash tree is not a simple tree removal. The brittle tree is so dry that it can break apart in unexpected ways and cause significant and expensive damage. Your Giroud ISA Certified Arborist will evaluate the tree’s condition. He will determine if a tree climber can safely work in the tree or if a crane and/or bucket truck is required. The longer the dead tree is left in the ground, the drier and more dangerous it becomes, making tree removal even more complicated and expensive. Inspection: Have your Giroud Arborist evaluate the tree and recommend the best action. Tree Removal: If the Ash tree is dead or has become unsafe, prompt removal is required. Treatment: If the Ash tree is still healthy enough to absorb treatment, a systemic trunk injection of Tree-age every two years protects Ash from Emerald Ash Borers. Regular Pruning: In combination with treatment, remove deadwood and prune to promote healthy growth. 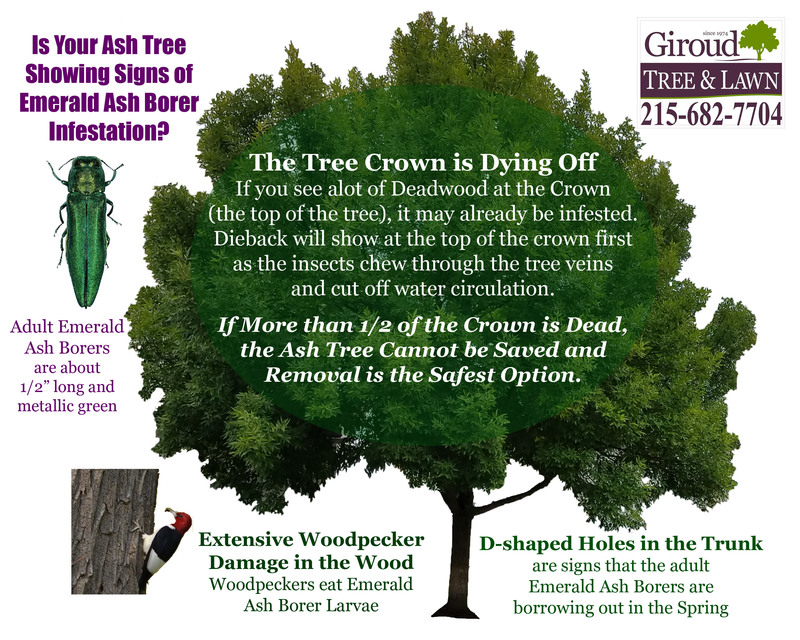 Call Today to Schedule a FREE Evaluation of Your Ash Trees while there’s still time! 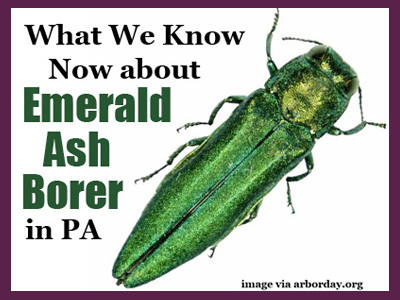 What We Know Now About Emerald Ash Borer in PA Overall rating:	4.8 out of 5 based on 2621 reviews.